We install patio doors across Dunfermline, Edinburgh, Stirling, Perth, Dundee, Rosyth, Fife, Glasgow and surrounding areas. There’s nothing like relaxing in the garden on a sunny day – why not complete the picture with bespoke patio doors? SRJ Windows offers the supply and installation of high quality patio doors to help you achieve the perfect fit for your home. 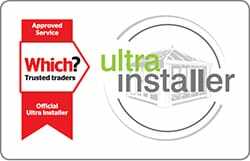 Our professional team will carry out your installation in style, for a long-lasting result every time. You’ll be able to bring something to your home that will continue to bring value and comfort long after their initial installation. Your garden enhances the look of your property and often plays host to gatherings of family, friends and neighbours. After spending so much time enjoying this greenspace, the addition of our patio doors is sure to be ideal for you. SRJ Windows are experts in window and door installation, and patio doors are a particular speciality of ours. With an attractive set of doors in place, you can bridge the space between your home’s interior and your garden. With sliding doors and personalised designs, our patio doors offer a contemporary look to any room. At SRJ Windows, we use the latest glazing technology, which means all of our glass comprises a low-e and toughened design that may help to keep your energy bills low. You’ll be able to enjoy a more comfortable home throughout the year. At SRJ Windows, we want you to enjoy your patio doors for years to come. Available in a wide range of tasteful colours, our products are all covered by our platinum 10-year guarantee and are tested to withstand the Scottish weather. Let the sun into your home with our custom designs and straightforward results, making things as easy as possible for you. All of our patio doors utilise high performance, multi-wheeled rolling systems to ensure easy and smooth function every time. Not only this, but as the running track prevents the sash from swerving to the side, it always remains tight and safe. You’ll be able to enjoy safe, simple and gliding operation across the board even after constant use over the years. As patio doors feature a horizontal sliding door panel, they don’t need a swing arc to operate. In turn, this means that they can be easily installed into smaller spaces. They also bring the added benefit of allowing you to utilise the space that you do have in a more decorative way, with the option of putting lamps or plants next to the door without worrying about knocking them over. To match your tastes and the style of your home, our patio doors can be fitted in a wide range of colours and finishes. This range extends from classical white to laminates in woodgrains and plain colours. Whether you’re looking for something subtle, or something that really stands out, we’ll be able to give you the perfect fit to suit your home. 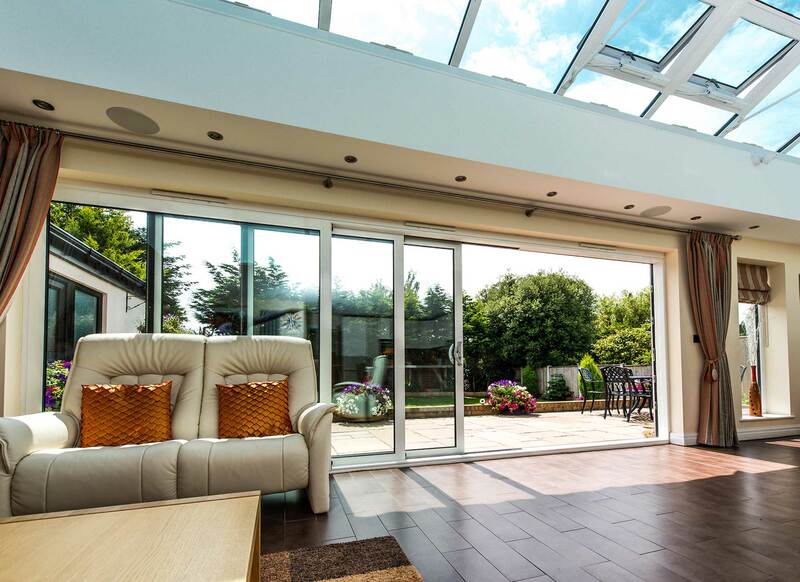 To increase environmental friendliness, and to prevent any health risks, all of our patio doors are exclusively manufactured with lead-free PVC with ‘green’ stabilisers based on calcium and zinc. This means that you’ll be able to bring a new door to your home that is completely sustainable and works to protect the environment in an effective way. Due to their modern profile, our patio doors are able to offer the highest standards of performance without having to rely on bulk. The five chamber profile offers slim and sleek sightlines, which not only offer style they also help natural light flood into your home. With a slimmer frame, our patio doors can have larger panes of glass for increased views. Even when closes, our patio doors will work to open up any room in which they are installed. The expert combination of highly secure locking systems, premium grade materials and professional installation allow our patio doors to achieve outstanding security. Further to this, they contain an aluminium-reinforced centre section for enhanced structural integrity. You’ll be able to rest assured that your home is protected from any would-be intruder, including modern burglary trends. Due to their inherent build, our patio doors comprise high quality uPVC that allows them to outclass a timber alternative. This means that they are impervious to swelling, bowing, cracking or rotting over time. All you will need to do is give them a wipe down with soapy water to keep them looking ‘as new’ in your home, ensuring they bring lasting value that will prove to be a worthwhile investment for your home. Visit our online quoting engine to get a free, bespoke and competitive patio doors price. A member of our friendly team will be more than happy to help you get the ideal price for your needs. You can also get in touch with us should you have any questions, or visit our Fife showroom to see our patio doors for yourself. We’ll always be more than happy to help you find the right patio door for you.